During your Kayak Safari adventure, you’ll get the chance to cherish a beautiful summer’s day on the water. 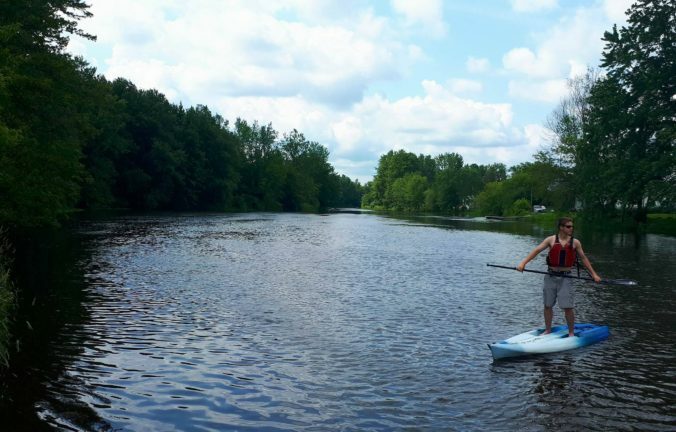 On the Athelstan course, where you paddle for 7,6km on the Chateauguay river, you will see two bridges : the Gilmore and the Walker. 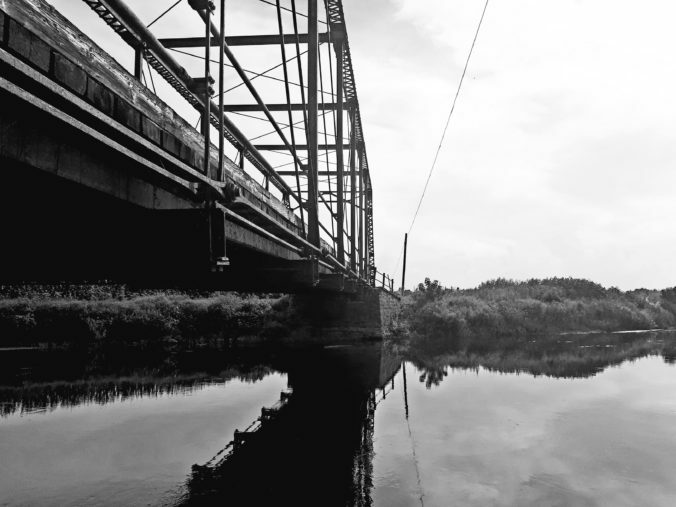 The Gilmore bridge has always been a mysterious location. It is an abandonned bridge and the road is closed down. The reason said by most of the locals is because of a lack of finances to repair and maintain it. But, there is also an urban legend that collides with popular belief. It’s the story of the fallen fisherman. In the early 1900s, a convict broke out of an american prison located in the Adirondacks. Apparently, he was in jail for several murders. He would’ve crossed the border illegally and made his subtle nest in the small town of Athelstan. One of his passions was fishing and the Cheateauguay river was filled with a large variety of fish. He was feeding himself with his catches and having fun, perhaps forgetting his dark past. It is sepculated that one stormy day in spring, while fishing on the Gilmore bridge, the fisherman slipped and fell in the river, drowning himself in the process. The body was never found. There are rumors that the ghost of the american is now haunting the area at night, terrorising anyone who approaches his beloved fishing spot. All these apparitions wouldve forced the locals to condemn the bridge and the road. Perhaps, this legend brings an unanswered question : how did an experienced fisherman drown randomly in the river? Some say that the american man had a lot of ennemis, mainly due to the fact that he didn’t socialize with anyone. That can be a reason why the ghost of the fisherman haunts the bridge, by desire of vengeance. Another theory is the karmic energy one. Did a man guilty of murder deserve to have a peaceful and prosper life? Legend or not, come visit Kayak Safari without the fear of encountering a ghost : he only comes out at night! A bacteria that makes you happy! The presence of bacteria in nature is known to have many beneficial effects on the mind and the body. Being surrounded by vegetation reduces stress levels and gives you a break from day to day burdens. That being said, there are many types of bacteria that have a bad reputation. However, the Mycobacterium Vaccae, for example, has multiple medicinal properties and is very useful for many aspects of the human mind and body. First of all, its name comes from latin. The word Vaccae means cow, which makes reference to the fact that the bacteria was first discovered in cow dung … also known as manure. This bacteria is found almost everywhere in nature, it is especially common in land that can be harvested. When you breathe the bacteria, it rises your serotonin levels in your brain, which directly leads to a reduction of anxiety and stress. One of the many roles of serotonin is to transfer information between neurones, while at the same time controlling your mood! Having a low quantity of serotonin is linked to bad digestive functions, weak sexual drive and a lower bone marrow. So, if you have an opportunity to rise your serotonin, do it. Other benefits of the Mycobacterium Vaccae are helping asthma, depression, leprosy, eczema and even some cancers! At Kayak Safari, you’ll be able to get your dose of bacteria. There are a lot of Vaccae particules in the air while you kayak on the river. During your adventure, you are surrounded by soil and cultivable lands, which means you have a great deal of exposure to Mycobacterium Vaccae! At Kayak Safari, you will have many adventures. 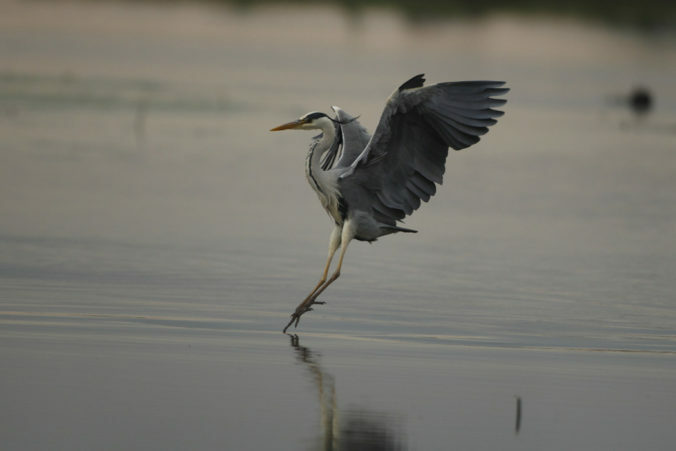 Part of this experience is the chance to encounter the famous heron, Freddy Mercury! Freddy is part of the Ardeidae family of birds. This species has a reputation of flying with their necks retracted rather than outstretched. Don’t make fun of him for it! He has cousins in every continent, except Antartica. The only sort of environments that Freddy wouldn’t live in are the driest deserts, extremely high mountains and subzero temperatures in Antartica. You will find Freddy near the water because that’s the heron’s favorite area to live in. Fun fact : herons are non-swimmers! It’s ironic because they are often associated with water. Like 90% of birds, the heron is monogamous, which means that he only mates with one female. Therefore, Freddy is loyal. New generation, take notes! Herons are also colonial, which means they live among other herons. Even if Freddy seems to look lonely, he’s actually not : he has many friends. One of the heron’s most interesting feature is his hunting abilities. He is carnivorous and has many aquatic prey, such as fish, reptiles, amphibians, mollusks and insects. Anything goes…except plants. Freddy, being an experienced hunter, uses many techniques. He usually just stays motionless in shallow waters, and waits for prey to come within range. As soon as he has an opportunity, he strikes with his pointy beak. During your adventure, make sure to watch for the herons. There are many of them on the river, all led by Freddy! Seeing a heron is not an everyday occurrence, so if you do, take a quick picture! As of last year, Kayak Safari has acquired brand new SUPS (stand up paddle boards). This activity is not only the ‘it’ water sport of the moment; it also benefits your core muscles, your balance and even has calming effects! Stand up paddle boarding is a great way to stay in shape while enjoying the river. Paddle boarding is an all body work-out, focusing mainly on your abs and your mid back muscles. Depending on your speed, it can also widely benefit your shoulder and arm muscles such as triceps and biceps. So if you are looking for a way to strengthen your body while enjoying a peaceful day on the river, look no further! SUPS are well known to help improve balance as well, be it for personal satisfaction or to help improve skills in another sport; balance is key for any type of physical activity. Your legs muscles will also be hard at work trying to keep you upright on the board. When it comes to weight-loss, this low impact sport works wonders because it allows you to use up a lot of calories, while at the same time reducing the risks of damage to tendons or ligaments, injuries that you are more likely to find in high impact sports such as weight lifting. Paddle boarding can help you attain a healthier lifestyle. Stand up paddle boarding had more than just a physical reward.Be it by performing yoga on the paddle board or simply just relaxing on the river, SUPS have a huge impact on our stress levels and help to bring peace of mind. Your body and mind work in unison to get into that paddling rhythm. So if you are just looking for a peaceful day on the river, or a new way of working out, come and try our SUPs at Kayak Safari, they will be sure to fit your needs! The battle of the Chateauguay was a military head-to-head that happened in October 1813. It was a conflict between England and their allies, notably the colony of Lower-Canada and some Huron and Mohawk helpers, to the Americans. To understand the battle, it’s important to know that the USA, recently became independent of England and that they were still in opposition. Lower-Canada (Now known as the Province of Quebec), was a British colony that was neighbouring to the Americans. The US army decided to process to an aggressive military strategy by planning an attack in Montreal to cut the shipments to the Upper-Canada (actual Ontario). 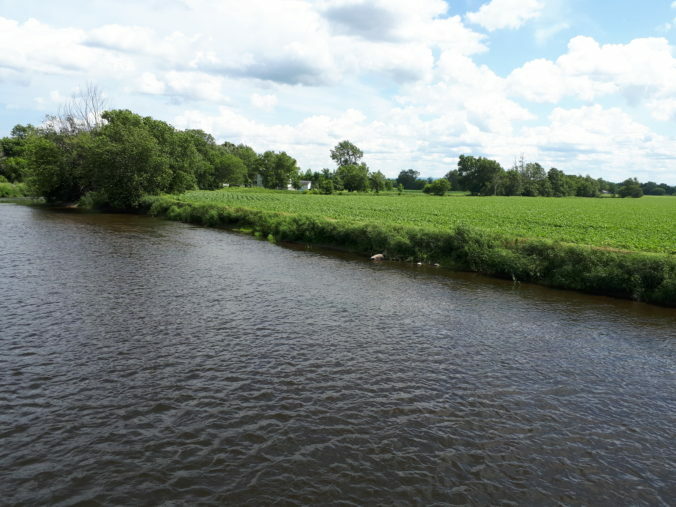 An American army of 3000 men, commanded by the Major-General wade Hampton, took the Chateauguay river towards Île-Perrot, where they had a second float waiting for them. More than halfway there, they were intercepted by the military troops of Charles de Salaberry. That British defence was composed of 1800 men, mainly soldiers, French Canadians and Natives. Their strategy was to set up traps in the way of the Americans to slow them down and potentially stop them. It’s at Allan’s Corner, actually located between the towns of Howick and Ormstown, that the British won the battle. It was decisive and there were more than 100 injured and around 50 deaths. 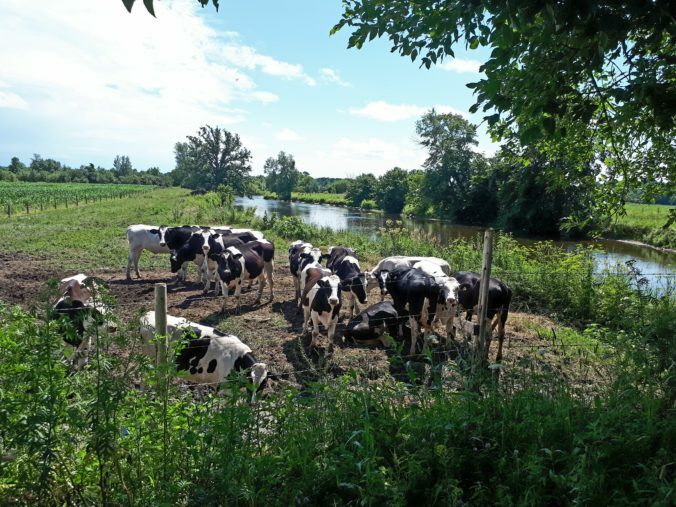 The battle of the Chateauguay is considered a turning point in Canadian history. Without that victory against the Americans, Canada would’ve been different and potentially part of the United States of America. Come spend a day at Kayak Safari and make the most of those historical waters, fundamental to our Canadian history. Copyright © 2019 Kayak Safari. All Rights Reserved.